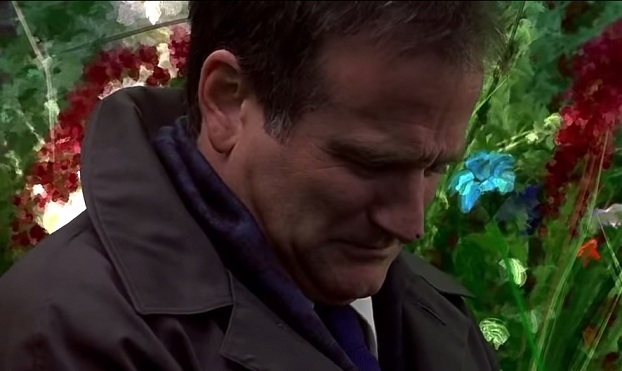 When I first read about Robin William’s suicide, I immediately thought of the suicides in my family… not even a year has passed since the most recent one. Sigh. Depression can take even the best of us down. It is not to be taken lightly. It is a monster, a big, powerful, unrelenting monster. Depression will come and go. It is rarely a constant in the life of one who suffers from it so it is important to manage it as best you can, stay one step ahead of it if possible. Your dreams being void of color and in shades of grey. – In dreams colors can symbolize your current emotional state. Yellow can represent fear, red can represent anger. Blue can point to the blues, but it is more a situational blues such as being blue over your best friend moving away rather than a full on depression. Overwhelming grey in a dream is more often a tell tale sign of depression as it indicates a lack of vibrancy in your mind. Frequent falling and/or drowning dreams. – When falling or drowning you are going down and that’s the operative word here, down. Depression brings you down. It is heavy. It’s like an elephant sitting on you. And it can feel like falling or drowning, like there is nothing to support you. Your emotions, your thoughts,your hopes, everything just keeps going down, down, down. Dreams bring to life what is going on in the psyche. Something submerged below the surface of water about to emerge. – This is one I get a lot, usually it is an alligator below the surface of the water but it has been other nondescript things. In this sort of dream the surface of the water would represent your emotional surface and the creature or object just below it is the depression getting ready to rise and show its ugly self beyond your ability to keep it pushed down. – Dark rooms often symbolize the darkness within yourself. Often, a person will dream of a house that has a dark room in it (not the type of dark room that is used for photography but rather a room with no light) and the person is afraid to go in there. Sometimes they are feeling pushed in there by an unseen force. This dream is a big time warning that your dark depression needs you to focus on it so you can manage it. Shadows in dreams can often represent the part of the self that we consider our dark side, the Heisenberg to our Walter White, so to speak. If the shadow is becoming threatening to you in your dream, and it is a frequent dream then this could be your depression beginning to take over. – Rain in dreams is a classic symbol for tears in real life, often tears you have not allowed yourself to shed. We all have situations that cause us to be sad but if the rain in your dream is frequent and especially if it’s a torrential downpour, this could be your depression getting ready to drench your psyche once again. Obviously, we are all different and can have our own personal symbols for depression in our dreams but the ones mentioned above are fairly common. Often, they will show up in your dreams as a warning because your body is telling you a bout of depression is on the way. This will allow you to prepare for it. You can plan to spend some time outside with friends. Surround yourself with people who make your laugh. Go see a funny movie or volunteer. Helping others can do wonders for your psyche and your soul! There are also times when you are already in the throws of darkness when these dreams happen. At that point your dreaming mind is merely showing you what the inside of your mind looks like. A picture is worth a thousand words, as they say. Sometimes seeing yourself in a different perspective can help you to make better decisions regarding your depression. Ug. I don’t want to be void of color on the inside. I really should get help, for example. These are the times you need to tell someone what’s going on with you. They will want to help you! Most depressions don’t end in suicide, but enough of them do that we all need to take depression more seriously. If you have depression DO NOT BE EMBARRASSED to tell someone. At the very least, you can call a depression hotline. I Googled it so I could put one here in the post but there were so many! There is help everywhere so ask for it. Depression CAN be managed. Things can get better. * If you’re having disturbing dreams, I would be honored to help you. I’m the best in the business and can help you fully understand every part of your dream, find the issue that is causing the dream and the message and guidance your dream is giving you. Getting your dream analyzed is a far bigger deal than you may realize! It goes deep and can absolutely change your life! * I also have a very thorough dream book called Dream On It, Unlock Your Dream Change Your Life that will help you easily learn how the dreaming mind works, how to connect your dream to what is going on in your life and how to find the message. It also has a dream dictionary in the back for easy reference. This book has been featured on Dr. Oz 3 times! You’ll be glad you have it on your bedside next time you have a strange or upsetting dream. I had a dream when i was seven and have had it every now and then since then. I'm in a strange place i don't recognise, solid gray floors and midnight blue walls that i can't tell where they end. there are three old men a few feet away. one become a snake with brown diamonds on its back, one becomes a young handsome man, and the other drops dead. the young man runs a few feet with me as the snake gives chase and pushes me through a trap door, which is made of old weathered brown wood, i see dusty jars filled with something dark in my periphery vision. light cracks through as the door is opened, like sunlight, then it's flung back and instead of being blinded by the light i see a white face with a gaping maw, and black where the whites of the eyes should be with red pupils, smoke trailing behind it as it lunges for me. after that i wake up. i've tried talking to my parents about it but by the time the word nightmare leaves my mouth they say "figure out what you're afraid of" or "change the dream." Your dream is connected to some constant in your life that's been going on for as long as you have been having the dream. Typically when we are searching for someone in a dream, it means we feel something is missing in our real life. What in your real life is missing? To add, (you might mention my comments on this article on your site) DO NOT BE ASHAMED TO CRY (even if you're a man). It's better and healthier to release your emotions rather than keep them inside. I have had a lot of deadly bladder infection nightmares when i do that…so i don't hold my tears back. I frequently get nightmares about speakers not working, shorting out or blowing if I am not handling my emotions right. On an additional "note", i also get a LOT of 'dreamares' about starring in Flux Pavilion's "Bass Cannon" music video as a WILLING contestant of some perverted audio experiments…and loving every moment of my bass drop suicide from all of that powerful sonic "pressure"…get it??? It's a metaphor for how the depression "drops" in! That's my dreaming mind letting me know to just "kick it" and let things go, but that screaming sound at the bass drop is also representing my own inner screams and releasing all of the pent up power. It's also my dreaming mind giving me a pat on the back and saying "once the depression over, you'll have a blast! '-which ALWAYS happens after I beat depression or any negative mood for that matter especially if I use some amino acids to stock up on what neurotransmitters I have lost. Once I trouble"shoot" it, I'll not only find out what is making me so upset but why and what I can do (like refueling my neuro-fuel tanks) to actually fix the issue, instead of just sweeping it under the rug with a drug or a smile…lest i have nightmares of the mess, dust and masks under it turning into a monster and attacking me! Bass drops are like a deep tissue massage for me especially over some vehicle subs!!! Like i always say, when in doubt, LET THE BASS CANNON KICK IT!!!!!!!!!!!!!!!!!!!!!!!!!!!!!!!!!!!!!!!!!!!!!! Yep! I got every symbol right before reading!!! You also might want to mention the miracles that supplementation with amino acids, vitamins and minerals and eating good nutritious food can do to help your depression, too. That is also a major cause for depression in this culture (yes it's a real thing even though it sounds like a health expert shoving this sh*t down your throat. Just look up Julia Ross…) I once had a nightmare about sugar and grains being a poison and meat and lard (yes…animal fat) being the cure that saved my life. It was telling me the truth about what I was putting into my body moreover what it was doing to me both physically and emotionally! One of my warning symbols is being stalked or chased, much like the "below the waters surface" nightmare. As a matter of fact, my vacation went horribly, but on the next morning before we went home (my REM sleep starts getting very vivid around the time I wake up) I had a nightmare about being in a pale, dimly lit hallway with the cast from "Cloudy With A Chance of Meatballs 2" (cloudy…get it?!?) and we were desperately trying to get back home (which we were going to be doing in waking life that morning) and the head of the company (it was a family trip too…are you seeing a pattern yet?) who was not only stealing Flints inventions, but he had even tortured him (removed a liver) as punishment for trying to leave! It had a potentially happy ending, as we were able to get the grocery deliverator operating (with some tweaks to enable human transportation, but only if you had nutrient rich food in your gut!) to get back home. More good mood food symbols…………..I think my dreaming mind isn't too happy about what I've been eating on vacation, either…..it's great to be back home though! I was freaking out trying to get it plugged in though!!! Much like how I was feeling in waking life, it was a struggle! Great article! I'll definitely send this in my sister. I hope she can learn from this to handle her own struggles.